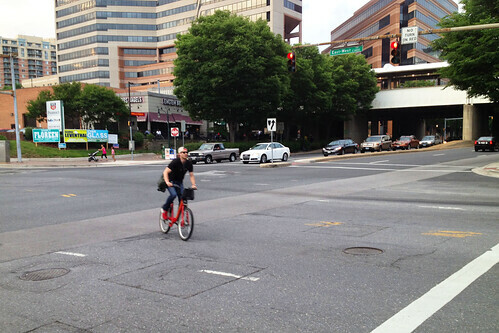 A Capital Bikeshare rider passes by some big campaign signs in downtown Silver Spring. Photo by the author. Tomorrow's primary election is a big one for Montgomery County, with contested seats in many local races, from school board to county executive and, of course, governor. These are the races that will have the biggest effect on your daily life, as the people who occupy these seats are the ones who decide everything from liquor laws to whether our neighborhoods remain affordable places to live to public school funding. And as Montgomery County continues to grow and evolve into a more diverse, urban place, it's especially important that we have representatives at all levels of government who get that and are actually committed to making it a better place to live and work, instead of simply standing in the way. For the first time since at least 2006, back when this blog first started, voters can actually choose between candidates with very different visions for Montgomery County, so you might as well put your two cents in. If you're still looking for some last-minute insight, there are lots of great sources for learning about the candidates, notably the non-partisan League of Women Voters guide. You can watch the candidates give video statements on MyMCMedia, the county's public access cable channel. Of course, there are the endorsements from the Washington Post and the Gazette. But for me, the most powerful affirmations I've gotten have come from friends, family and individuals in our community whose opinions I deeply respect. If you read local blogs like the Silver Spring Independent, Another Day in Wheaton, and the Blog of Diminishing Returns, you should check out what they've got to say about this year's election. Some organizations I'm involved with have weighed in too. The Action Committee for Transit has a scorecard ranking the candidates on how progressive they are on transit and land use issues. And One Montgomery, the group I helped start last fall to advocate for a more equitable and transparent public school system, released its endorsements for select local races. Now that you've got some information, all you've got to do is find your polling place, which will be open from 7am to 8pm tomorrow. And tomorrow night, you can tune into MyMCMedia to watch the election night returns and hear me talk about the role social media played in this year's campaigns. You can watch the broadcast live online or on several local TV channels, including County Cable Montgomery (Channel 21). Thank-you, thank-you, thank-you... Relatively new to the area and don't know much about the local candidates.